While looking for new porcini recipes to try, I stumbled upon one for tortellini with porcini mushroom sauce on Epicurious. The three-cheese tortellini, whipping cream, butter, and copious amounts of parmesan that it called for sounded too rich though. To make a lighter version of this dish, I substituted pennette rigate for the tortellini, half-and-half for the whipping cream, and olive oil for the butter. I left the parmesan out entirely and only sprinkled some on the pasta right before eating it. I also cut a chicken breast up into small cubes and sauteed it with the shallots for some lean protein. Despite all my substitutions, the creamy mushroomy sauce still proved quite heavy. The solution? Serve with a lemon wedge on the side. Citrus flavours cut through rich sauces wonderfully. If you want to make the sauce creamy and lighter cook the mushrooms in just one table spoon of olive oil (in Italy we usually cook mushrooms with a little bit of garlic and persil too), add half a glass of half-skimmed milk almost at the end, cook at high fire while stirring and before the milk is completely dried add a pinch of "liquid flour" (a kind of flour used for sauces and soups, it doesn't make clots) to make it creamy. The result is like with butter or cream, but without the calories. Al, thanks for the tip! Yum! 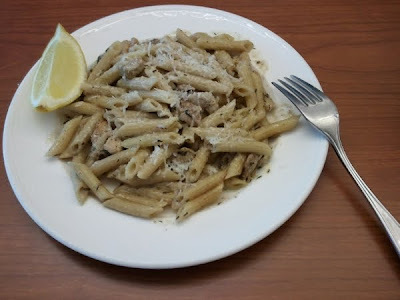 Thanks for sharing this recipe - after eating freshly cooked pasta for the past 3 weeks, I don't think I can bear to eat Olive Garden or restaurant pasta ever! Will try this recipe out! Thanks Lisa!